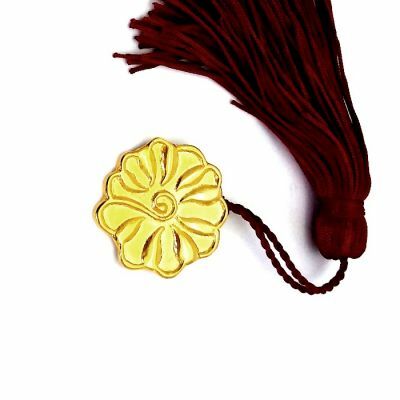 Rosette 9leaves gold-plated 24K charm. This year we chose a design from a vase decoration from Kamares in Crete. The nine leaves symbolize the year 2019 together with an artistic "9" in the middle. The vases were found in the Palace of Knossos and are dated around 2000-1700 b.C. The charms even in the ancient times were used as symbols of good luck and protection and that is why today we tend to identify them with the coming of the new year and the hopes to bring good fortune to our lives. It is a symbolic gesture that shows our appreciation to whoever is given as a gift. We continue to enrich our charm collection with gift proposals desinged in a minimalist approach to satisfy the most demanding tastes. 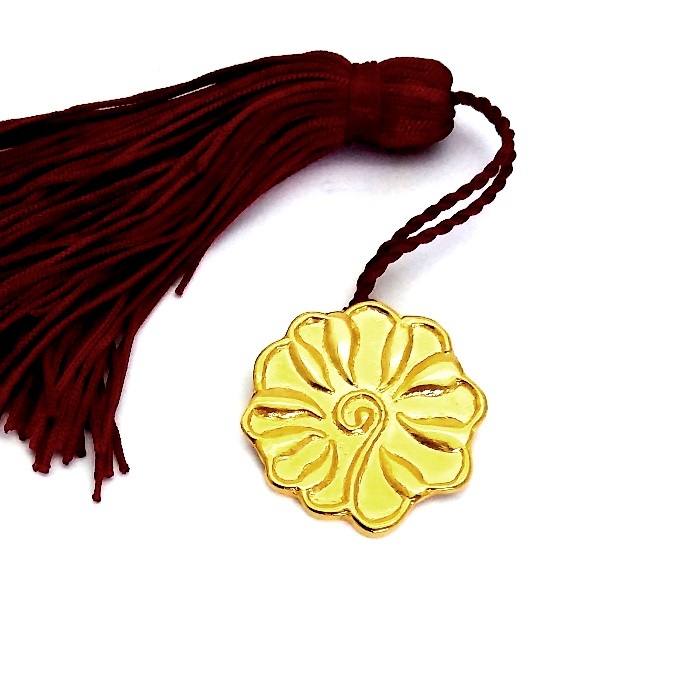 Handmade solid brass gold-plated 24K with tassel. You can also, see our collection of charms. Every item is offered in gift packaging. Order now your copy or offer it as a unique gift. All of our creations are handmade and are accompanied by a certificate of authenticity and a guarantee of our workshop. Kamares wares are a distinctive type of Minoan pottery produced in Crete during the Minoan period, dating to MM IA (ca. 2100 BCE). By the LM IA period (ca. 1450), or the end of the First Palace Period, these wares decline in distribution and "vitality". They have traditionally been interpreted as a prestige artifact, possibly used as an elite table-ware. The designs of kamares ware are typically executed in white, red and blue on a black field. Typical designs include abstract floral motifs. Surviving examples include ridged cups, small, round spouted jars, and large storage jars (pithoi), on which combinations of abstract curvilinear designs and stylized plant and marine motifs are painted in white and tones of red, orange, and yellow on black grounds. At this time, this characteristic type of pottery was produced, with red, orange and white painted decoration on a dark background. The Kamares style was often elaborate, with complex patterns on pottery of eggshell thinness. This small drinking cup shows a simple version. Sets of cups and jugs have been found, and it has been suggested that these may have been used in ritual, though Kamares pottery presumably also graced the dining tables of the First Palaces. Surprisingly, the first Kamares pottery found in excavation came from Lahun in Egypt, and was discovered by Flinders Petrie. It is now in the British Museum.